Troponin levels are used in the diagnosis of acute coronary syndromes (ACS), however, levels may be elevated in many other conditions. A significant proportion of patients with stable heart failure (HF) have detectable levels of troponin using standard assays, however, the incidence of detectable levels of high-sensitivity troponin T (hsTnT) in HF patients is not extensively studied. As part of a trial assessing vascular function in stable HF patients, 32 subjects had hsTnT levels measured at baseline using a multi-channel analyser (Roche E Module). At baseline, 27 (84.4%) patients had detectable levels of hsTnT (median 13.8 ng/L, range 9.2–21.4): 12 (75%) patients in the non-ischaemic group and 15 (94%) in the ischaemic group. A total of 14 (43.8%) patients had levels above the 99th percentile of the normal range. The majority of patients with stable HF will have detectable levels of troponin T using new high-sensitivity assays. A significant proportion of these will be above the cut-off point used for diagnosis of ACS. If these patients present to hospital, modest elevations in hsTnT do not necessarily indicate recent ACS, and serial measurements should be undertaken if clinically indicated. Troponins are proteins found within cardiac and skeletal muscle fibres with the physiological role of muscle fibre contraction by allowing cross bridging between actin and myosin filaments. In certain situations these intracellular molecules can be detected in the plasma, indicating loss of integrity of the cell membrane. In most cases this is due to cardiac ischaemia or infarction, and troponins have a well-established role in the diagnosis and risk stratification of acute coronary syndromes (ACS).1 However, many other cardiac and non-cardiac conditions may result in detectable levels of cardiac troponins in plasma (box 1). Several studies have reported elevated levels of cardiac troponins in patients with HF in the absence of ACS,4 and, as in ACS, degree of troponin elevation correlates with worse prognosis.5,6 A recent review of troponin elevations in HF found an overall hazard ratio of 2.85 (95% confidence interval [CI] 2.02, 4.03) for mortality in patients with elevated troponin.7 Table 1 summarises significant studies of troponin levels in HF patients. More recently, the need for a biomarker with adequate precision and a low coefficient of variation at the upper limit of normal in the reference population, has prompted development of a new generation of troponin assay. A fourth-generation high-sensitivity troponin T (hsTnT) assay developed by Roche can now detect troponin T levels down to 3 ng/L with a 99th percentile value of 14 ng/L in the normal population.8 Tentzeris et al. found hsTnT to be elevated in 58% of patients with chronic stable heart failure,9 and in a Japanese study of 85 patients with dilated cardiomyopathy, hsTnT was elevated in 54% of patients (compared with only 5% with elevation of conventional troponin T), and again, was an independent predictor of worse prognosis.10 Elevated troponin levels in HF patients tend to be more common when measured using high-sensitivity assays compared with earlier generation assays, although there is wide variation between studies (11–54% for low-sensitivity assays and 43–92% for high-sensitivity assays).6 Patients with HF tend to have multiple hospital admissions and may have troponin levels measured on admission. The finding of a raised troponin may suggest possible ACS and lead to unnecessary and potentially harmful treatment. The frequency and degree of troponin elevation in stable HF patients without ACS, particularly using new high-sensitivity assays is, therefore, of interest. As part of a study assessing the effect of statin therapy on biomarkers of HF, we studied 32 outpatients with stable HF. Patients were recruited from heart failure clinics within the Belfast Health and Social Care Trust. females were excluded if they were pregnant or lactating. HsTnT was analysed on the Roche Cobas E602 multi-channel analyser (Immunoassay E Module) at the Belfast HSC Trust laboratories. In total, 32 patients were recruited. The majority were male (78%). Mean age was 63.5 years (standard deviation [SD] 10.9). Mean body mass index (BMI) was 30.4 (SD 6.0) and seven patients had a BMI >35 kg/m2. Six patients (20%) were diabetic and 12 (37.5%) had a history of atrial fibrillation. Four (12.5%) patients had significant valvular heart disease (classified as at least moderate valve regurgitation or stenosis). The mean serum creatinine was 103 mmol/L (SD 28.6). There were 14 patients (43.8%) taking antiplatelet therapy (all aspirin) and 14 (43.8%) were taking warfarin. Patients were on typical HF therapy to include beta blockers (90.6%), ACE inhibitors or ARBs (96.9%) and spironolactone (56.3%). Overall, 16 patients (50%) had non-ischaemic cardiomyopathy. All patients were in New York Heart Association (NHYA) class II (46.9%) or III (53.1%) and mean ejection fraction was 31% (SD 9.6). Eight patients (25%) had an implantable cardiac device. HsTnT levels were available for 31 patients. 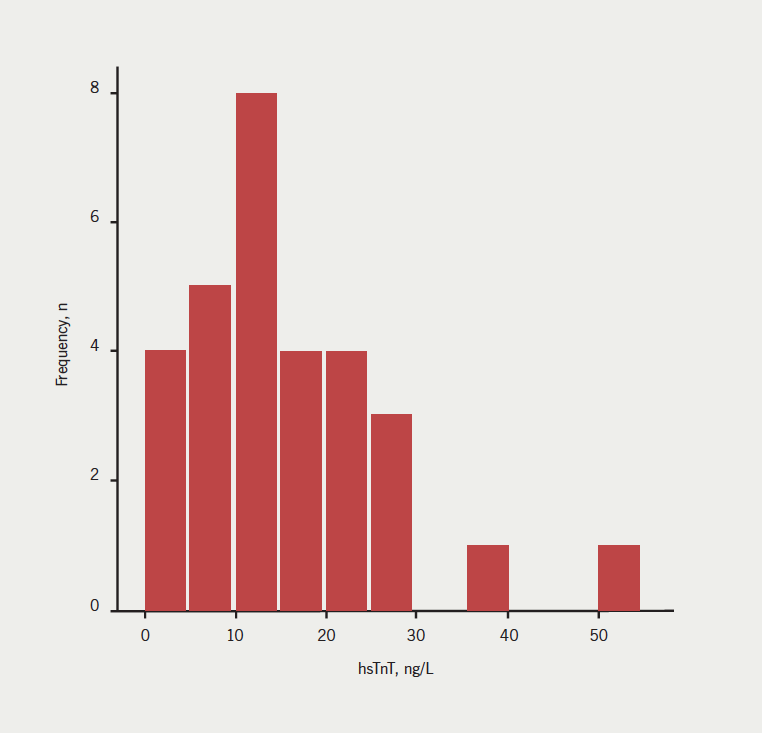 The frequency histogram for baseline troponin levels in the patient group is shown in figure 1. Median hsTnT was 13.9 ng/L (interquartile range [IQR] 9.2–21.6): 27 (84.4%) patients had detectable levels of hsTnT in plasma and 14 (43.8%) patients had levels above the 99th percentile of the normal range (commonly used as the cut-off for diagnosis of ACS). As cardiac troponins are generally used in the diagnosis of ischaemic cardiac syndromes, comparison was made between hsTnT levels in patients with ischaemic and non-ischaemic cardiomyopathies at baseline. There were 12 (75%) patients in the non-ischaemic group and 15 (94%) in the ischaemic group with detectable levels of hsTnT at baseline, while seven (44%) patients in the non-ischaemic group and six (38%) in the ischaemic group had levels greater than 14 ng/L. These differences were not statistically significant (p=0.33 for any detectable level and p=1.0 for level >14 ng/L). Serum levels were similar in ischaemic (median 13.93 ng/L, IQR 11.8–20.2) and non-ischaemic (median 13.71 ng/L, IQR 4.6–26.3) groups (p=0.80). In a subgroup of 16 patients, hsTnT levels were repeated after a period of four to six weeks. The median change in hsTnT was –1.2 ng/L (IQR –7.0 to +1.4) and this was not statistically significant (p=0.177). Cardiac troponin levels are known to be elevated in the HF population. The proportion of HF patients with baseline elevations varies in studies depending on population subtypes, troponin assay used, and cut-off point defined for raised levels. In this study, 84.4% of patients had detectable levels in plasma and 43.8% had levels above the 99th percentile for the normal range, which is a higher proportion than that described in many previous studies of patients with both acute and chronic HF,3 even when using a high-sensitivity assay. One previous study, using a high-sensitivity troponin assay, described a similar proportion of patients with detectable circulating troponin levels (92%), although this was using a pre-commercial assay.11 Interestingly, there was no significant difference between baseline levels of hsTnT in patients with ischaemic (13.9 ng/L, 95% CI 11.8–20.2) and non-ischaemic (13.7 ng/L, 95% CI 4.6–26.3) aetiologies (p=0.8). The mechanisms hypothesised to account for troponin elevations in HF, other than ischaemia, include neurohormonal activation, cytotoxic effect of inflammatory cytokines, cell stretch and the effect of oxidative stress, which may lead to chronic low-level troponin elevations. It could be hypothesised, therefore, that in clinically stable disease, the final mechanisms leading to chronic troponin elevation are similar in ischaemic and non-ischaemic aetiologies. Certainly, a history of major epicardial vessel ischaemia did not result in greater troponin elevations in this group. In this study, hsTnT levels appeared to be stable over a relatively short period of time. This is important to consider when the diagnosis of infarction is based, not only on elevated levels, but also on demonstrating a delta change in troponin levels. Elevations due to HF should remain relatively stable over short periods of time, with a median change of less than 10% demonstrated in this study. The findings of this study are limited by the relatively small sample size. Also, the patients studied had significant comorbidity, both cardiac and non-cardiac, which may have contributed to the finding of elevated troponin. However, HF patients typically have complex medical problems, and the patients in this study had similar levels of arrhythmia and valvular disease to the general HF population. Almost half of patients studied had baseline hsTnT levels above the standard cut-off point used for the diagnosis of ACS. As patients with HF often have co-existing coronary disease and may present with chest pain of possible ischaemic origin, it is important to recognise that modest elevations of hsTnT may not necessarily indicate a recent ACS. Although the guidelines state that a characteristic rise and fall in biomarker levels is necessary for the diagnosis of a myocardial infarction,12 in practice, serial measures are not always performed. In HF patients, if the clincial presentation is unclear, it may be prudent to await repeat measurements showing a significant delta change in troponin levels before prescribing potentially harmful ACS therapies. This research was supported by a Research and Development grant from the Public Health Agency Northern Ireland.